She buys mostly flowering plants and herbs. They die if I don't water them. The problem is that they need water at different times and I'm not very good at remembering to do it regularly. Some get too much and some starve. The common denominator is that most of them die ahead of time. Is self watering pots the best solution to my problem? Definitely, most plant nursery stores sell self watering pots. Other wise you can make something yourself. 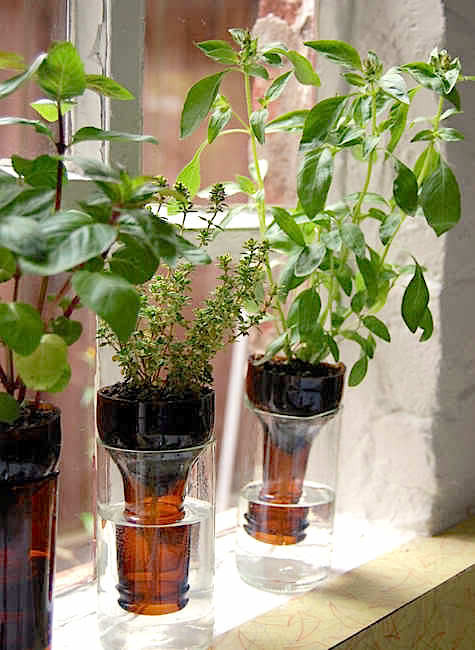 I have never done that but maybe I can make something for a small herb garden for the how to's! Heres a link to a picture for an idea. Heres another link for an option that is more aesthetically pleasing. I like the first one better because you can see what happens. Thanks!